Tyler Voorhees is an intern in the Office of Public Affairs at the International Trade Administration. He is a senior at Washington and Lee University in Lexington, Virginia. 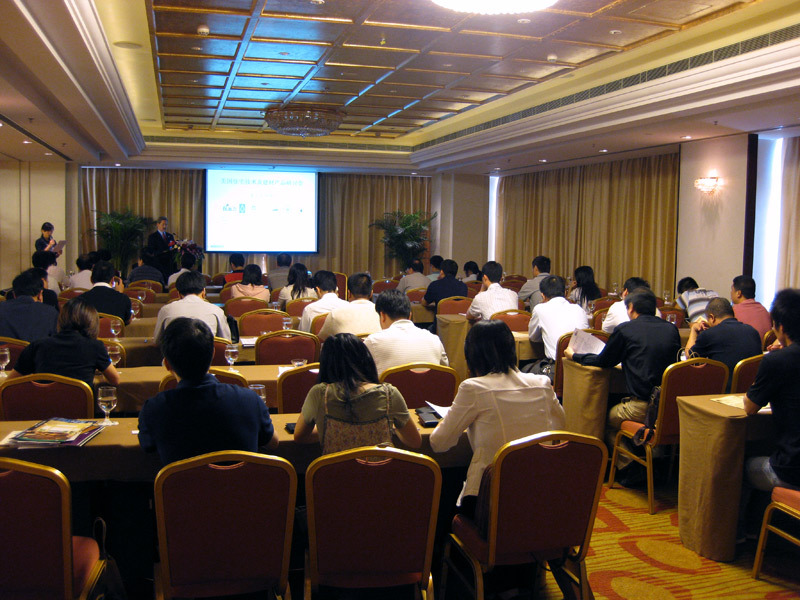 U.S. building materials industry representatives share the latest “green building” products and technologies with Chinese builders, architects and designers at a technical seminar earlier in 2012. Construction is an important industry to the American economy, and employs Americans in all stages of the supply chain, from logging to the manufacture of new and innovative building supplies. With low domestic demand, it is especially important for those in the industry to turn to foreign markets to help sustain and support American jobs. In developing countries, there is huge potential for U.S. building product exporters, especially in high-value areas. Currently, we’re seeing a massive new infrastructure builds in emerging economies, and they are looking for more sustainable construction technology, which is perfect for American exporters. At the International Trade Administration (ITA) we’ve made it a priority to help expand global market share for U.S. building products exporters. This export sector encompasses a wide range of basic materials ranging from basic materials (wood, glass, paint) to installed machinery (windows, air conditions). The sector employs roughly 2.2 million U.S. workers. There are many programs and initiatives within ITA that work with local businesses to promote trade and exports. Our Commercial Service has local chapters in major cities across the country and in many foreign markets to help match domestic suppliers with foreign buyers. One of the most effective programs we have though is the Market Development Cooperator Program (MDCP). Through MDCP, ITA partners with non-profit industry groups such as trade associations and chambers of commerce to provide funds and technical assistance for export promotion programs that are aimed at enhancing an industry’s global competitiveness in target markets. Non-profit industry groups are particularly affective at reaching local small and medium-sized enterprises, a focus for ITA. Partnership awards do not exceed $300,000 and partners pay two-thirds of the cost of the program while ITA provides the remaining third. This approach helps to ensure that the program is sustainable beyond the initial partnership. From 1997 to 2011, MCDP projects generated $219,000 in exports for every $1,000 invested. Any businessperson in the private sector would be astonished at such a high return on investment. Clearly, the MDCP program is a hugely successful program and a great example of the potential in public-private sector partnerships. Awardees range in industry as well as geography, yet all focus on expanding exports and increasing jobs. Some of the more innovative and successful partnerships include the hosiery industry targeting Japan to promote the export of American made socks and independent film industry. Engaging China is a priority within the Department of Commerce, both to highlight export opportunities as well as ensure fair trade. China is a particularly important market for building product suppliers for many reasons, most importantly shear demographics. There is projected to be over 221 cities with populations of over one million alone by 2025. This huge urbanization of not only first tier cities like Beijing, Shanghai and Guangzhou, but also second tier cities means that there will be many large, lucrative markets for U.S. suppliers. Not only that, there will be a growing middle and upper class that will want and be able to afford high quality homes as well an aging population that will soon need the same type of senior housing that we have in Western countries. In conjunction with positive demographic factors, the Chinese government has made it a priority to adopt more energy efficient technology, including building products and heating, ventilation and air conditioning (HVAC) systems. The Evergreen Building Products Association (EBPA) from Tacoma, Washington, has a proven track record of working with the MDCP program to promote exports to China through their U.S.-China Build Program (UCBP). In 2001, Evergreen submitted a project proposal that garnered their first partnership. The focus was to support the promotion of earthquake resistant building technology. In 2008, they submitted another successful project to promote green building technology in China. Just last month, Evergreen received their third award which is focused on promoting housing for elderly in China. Since their most recent partnership award in 2008, UCBP trade mission participants reported $190 million in export sales. This amounts to $1,283 in exports for every dollar of federal funding through the MCDP program! These exports sales translate directly to jobs for Americans- participants credit the program with helping to create 300 jobs in the last half of 2010 alone. The most recent proposal builds on their past work, but also highlights the promotion of senior housing. As China’s population ages, it will be necessary to consider new types of housing that can accommodate older residents. Given our older population, the U.S. building product manufacturers are already accustomed to this market. With the help of Evergreen, building product manufacturers are hoping to export senior housing building products abroad and grow their businesses. There are huge opportunities, and Evergreen will help by leading two trade mission annually and helping to match U.S. producers with Chinese buyers. Again, given the previous success of the program, everyone at ITA is excited about the prospects for this new MCDP grant. This is another example of the opportunities that become available to American companies as China grows and begins to consume the same type of goods at we do in America. To learn more about the MCDP awards, visit our website. Also, to learn more about the resources we have to help export abroad, visit www.export.gov.